Friday, May 18th marks the official start of Asheville Fling 2012. Our day will begin in the parking lot of the Four Points Sheraton, the hotel of record, where we will load the buses for our day's journey. The buses will leave promptly at 9am. Boarding will start around 8:40 am. Don't miss the bus! Our generous sponsors Corona Tools, the Whitegate Inn and Gardener's Hollow Leg are all helping cover the expense of the buses. 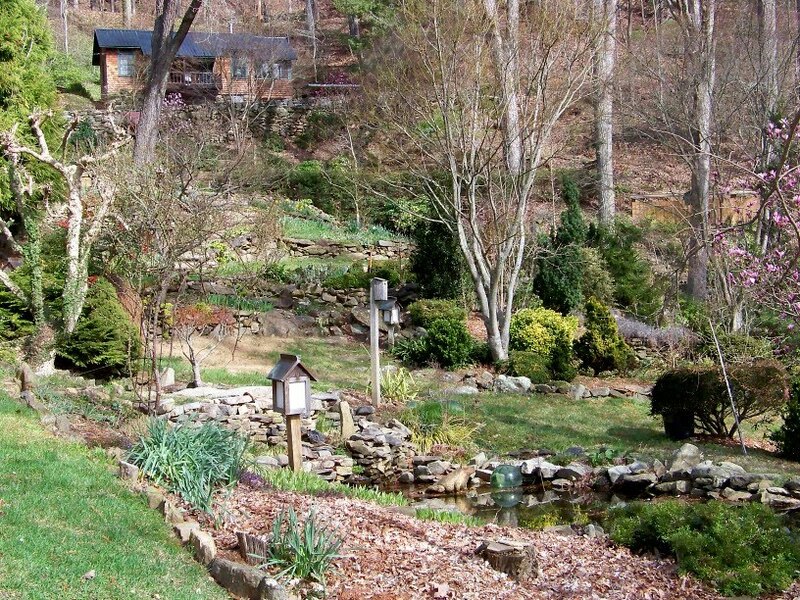 Our morning will be spent visiting four gardens in West Asheville. 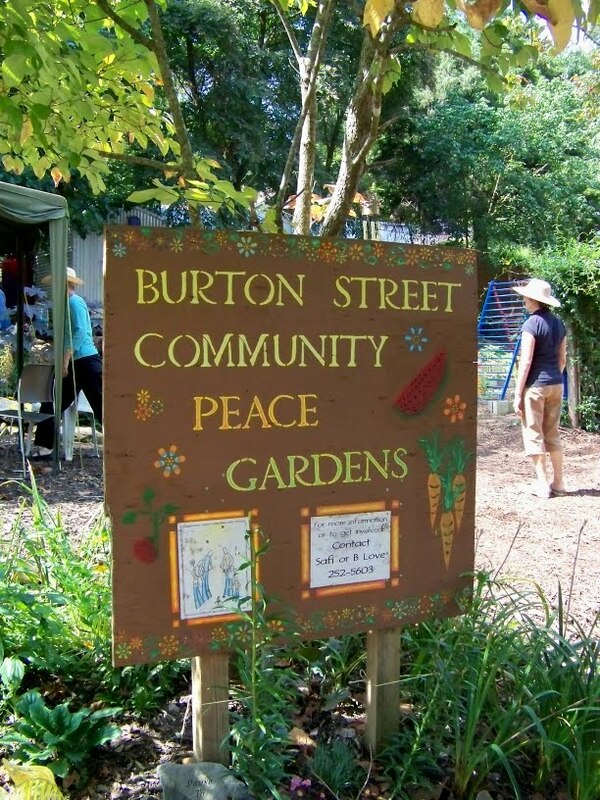 Because these are smaller gardens in suburban neighborhoods our capacity crowd would overwhelm them. 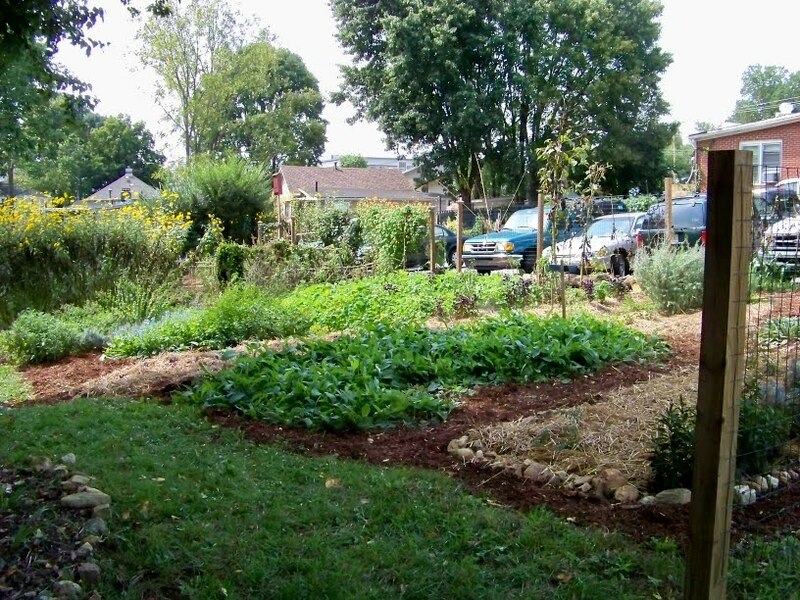 The buses will be sent on separate routes cutting our group in half for these four garden. 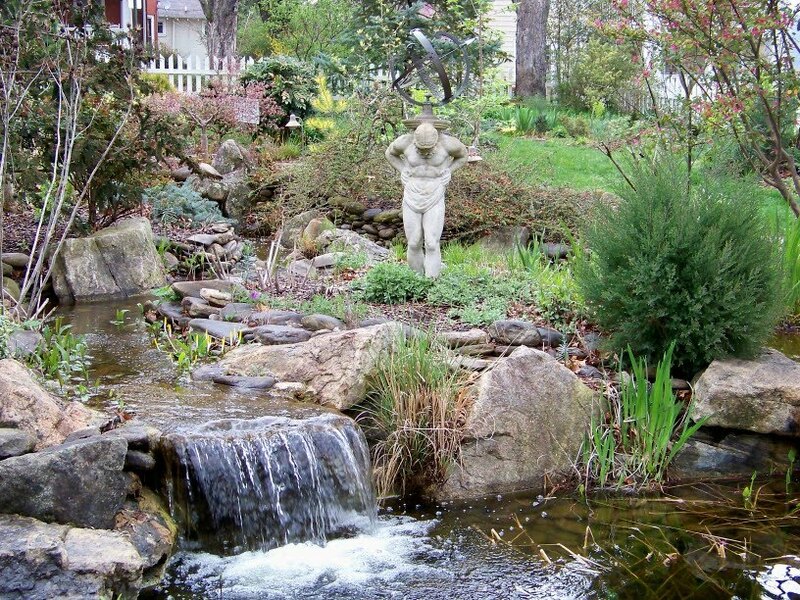 Wamboldtopia is the garden of artist Damaris Pierce and Ricki Pierce, an artist who crafts in stone. Both of their work is on display at Wamboldtopia and the result is utter enchantment. 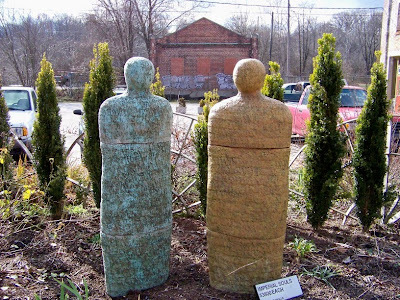 Christopher Mello is another Asheville artist and gardener with a quasi public garden due to its prime location in West Asheville. Christopher's garden is his play ground and is forever changing as he experiments with merging the botanical and the sculptural. 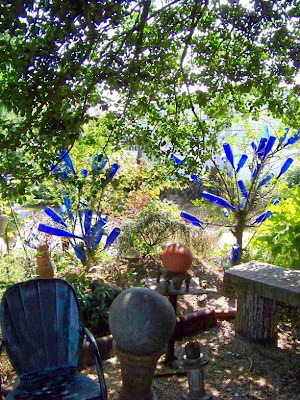 The garden is directly next to his working art studio shared with several other artists. Shopping opportunities will be available. 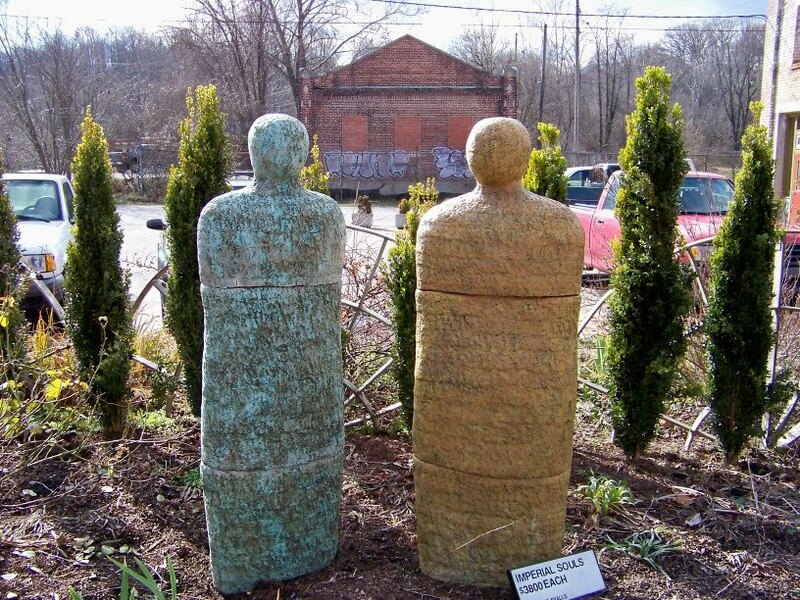 Who says community gardens can't be filled with art. Dewayne Barton and Safi Mahaba lead the efforts at the Burton Street Community Peace Gardens. 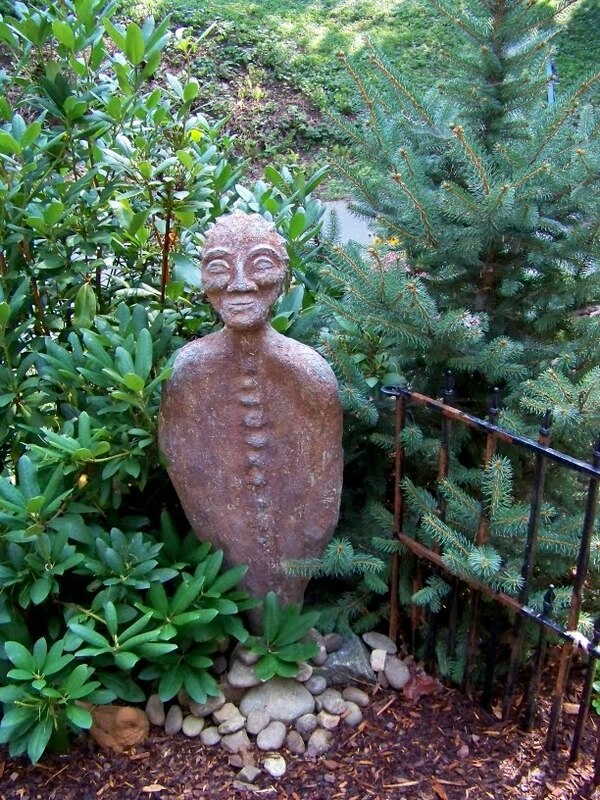 Dewayne has filled a food producing garden with art made from salvaged materials. Sunny Point Cafe kitchen garden is the epitome of farm to table with produce from the gardens out back going directly to the kitchen of this popular West Asheville eatery. All of the photos above were taken in the fall of 2009. 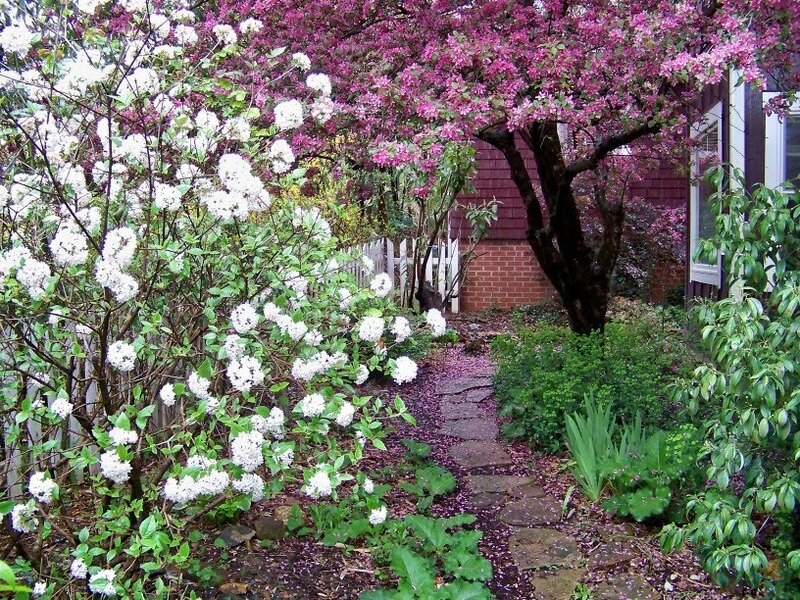 Much has grown and improved at each of these gardens over the years. Once a gardener's passion is ignited, it is rarely extinguished. Our buses will rendezvous at 11:45 am and the bloggers will become a capacity crowd for lunch in the gardens of Curve Studios directly across the street from 12 Bones BBQ who will be preparing our lunch. Homemade in Asheville ice cream including vegan and dairy free choices will be served up by The Hop for desert. The gardens at Curve Studios are praise worthy in their own right and are the creation of textile artist Pattiy Torno. Curve Studios is actually a three building storefront for several working artists. Shopping opportunities will be available. After lunch at 1pm the buses will head to the North Carolina Arboretum. Check out the website to help plan your visit. While there, Timothy Spira, author and Professor of Botany, Department of Biological Sciences, Clemson University will be offering a guided wildflower walk around the arboretum. He wrote the book, Wildflowers and Plant Communities of the Southern Appalachian Mountains and Piedmont and should have plenty to share. The exact details of the wildflower walk, whether there will be one walk or two is not quite pinned down. I'll fill that in when I know more. The buses will leave the NC Arboretum at 3:45 pm. Boarding will start at 3:30, earlier if you just want to rest. Don't miss the bus! Next we are heading to one of Asheville's premier nurseries, BB Barnes. The nursery will be hosting light pupus, wine and beverages during our visit. With acres of nursery stock, an orchid and houseplant gallery and a gardeners gift shop, you are sure to want to buy something. A 10% discount will be offered on your total purchase while we are there. I know you people. Bring some money to spend. The buses will leave for the hotel at 5:30 pm. Don't miss the bus! It is a long walk back to downtown from BB Barnes. Back at the hotel you are free to disperse and enjoy an evening and dinner on the town. 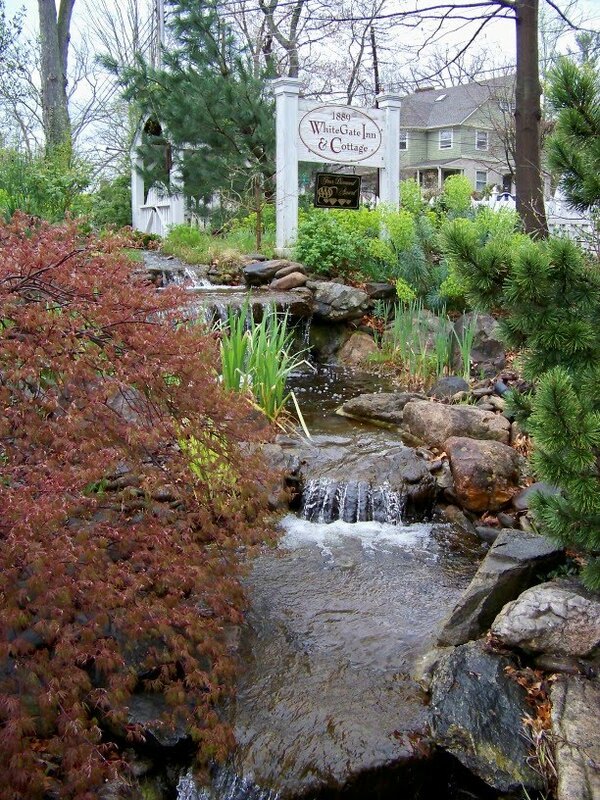 The White Gate Inn and Cottage, one of our local Asheville sponsors of the Fling is generously helping with the costs of our three days of tour buses. The Inn and cottage are an eleven room, four star bed and breakfast in a historic 1889 home located a mere two blocks from the hotel. 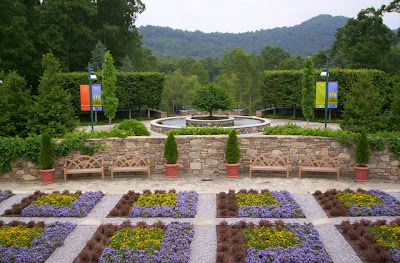 There is no need for a bus to visit the incredible gardens there which will be open during the entire period of Asheville Fling 2012. Are you an early riser and need to fill some time while waiting for the buses to head out for the days activities promptly at 9am? 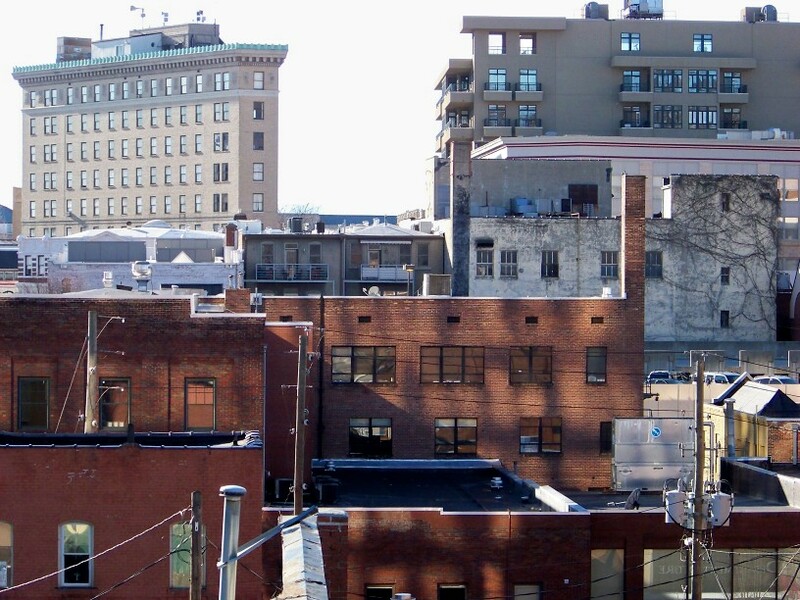 Or would you like a little stroll before or after dinner in downtown Asheville? The White Gate Inn is a short two blocks from the Sheraton hotel on the corner of Chestnut and Central Ave. Map is here. 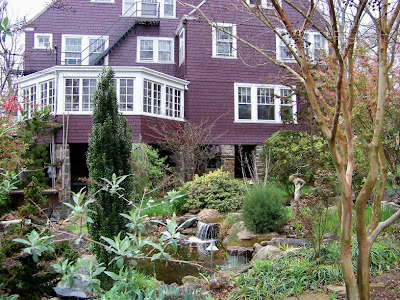 In the true spirit of gardener's willingness to share, the owners of the Inn will have the garden open to flingers from Thursday, May 17th to Monday, May 21st with the more formal visit time set to see the garden on the stroll to the continental breakfast Monday morning at Nan Chase's garden one more block away in this historic Asheville neighborhood. Ralph and Frank the proprietors of the Inn have created an award winning garden that will bring out the plant geek in all of you. This is a collector's garden of unique specimen trees, shrubs and conifers displayed with an artists eye. Your plant ID skills will be tested. 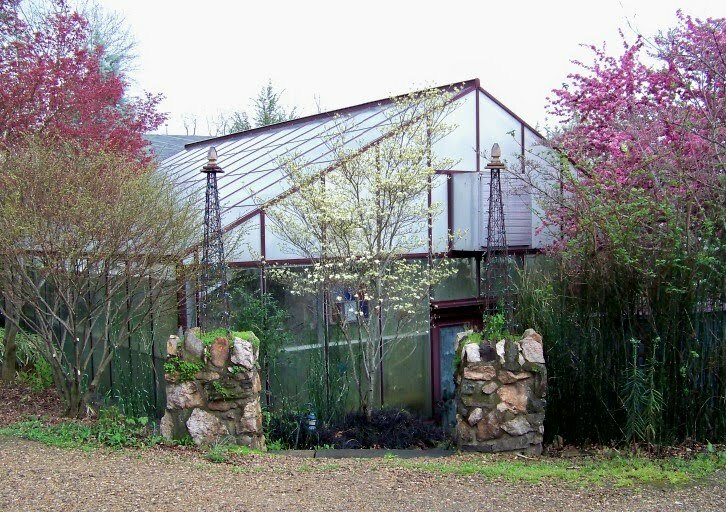 There is a green house filled with orchids, one of Ralph's other passions. If your stay in Asheville for the Fling 2012 does not include Monday, May 21st be sure to set aside a little time to see the gardens at the White Gate Inn and Cottage. Trust me. This is not something you want to miss. If you want to see more pictures of the garden in early spring and don't think it will spoil your surprise, another post on the gardens of The White Gate Inn is at my blog. As the garden bloggers begin to gather in Asheville for three days of garden touring, networking, socializing and blog talk there will be two pre-events on Thursday afternoon and evening. 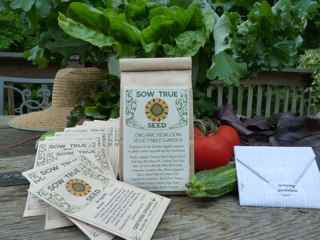 First our local sponsor Sow True Seed, at 146 Church St, seller of open pollinated, heirloom and GMO-free seeds will be having an Open House on Thursday afternoon from 1 to 5pm. Members of their team will be on hand to greet the bloggers, provide light refreshments and local beer, answer questions, and show folks around the store and small warehouse as they come by. Sow True Seed is located directly below and behind the new, modern, block long Lexington Station building, basically where Lexington and Church streets join. Access is from the Church Street side. If you come early or while waiting to check in to your room at the hotel this will be an excellent way to take your first walking tour of down town Asheville. Sow True Seed is a short 15 to 20 minute stroll from the hotel. Here's a map. I recommend the Lexington Ave. route for the ambiance or local color as some prefer. Thursday evening from 5 to 7:30 pm will be a meet and greet at Tressa's Downtown Jazz and Blues at 28 Broadway. Tressa's is one block from the hotel. If you arrive a little later in the day it will be easy to drop in once you are settled in at the hotel. Tressa's is also pinned on the walking map above. We have rented the upstairs of Tressa's for our group. There will be a cash bar. Light pupus will be provided to tide you over until your are ready to head to dinner on the town. And that's Thursday May 17th, warmup for Asheville Fling 2012. 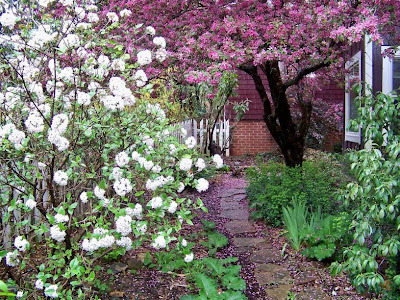 A garden at the first whisper of spring. Yes that's right. Free seeds. 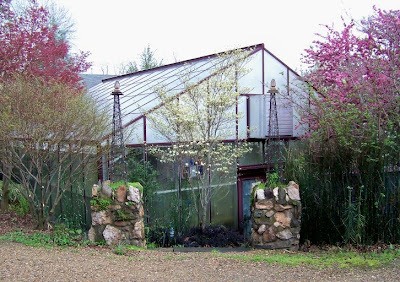 The team at Sow True Seed is excited to welcome the 2012 Fling’s Garden Bloggers to Asheville in May! In preparation for your arrival, they are offering registered and paid attendees of this year's Fling two free seed packets of vegetable or herb seed. Just take a look at their 400+ varieties of open-pollinated, GMO-free seed on-line at www.sowtrueseed.com. 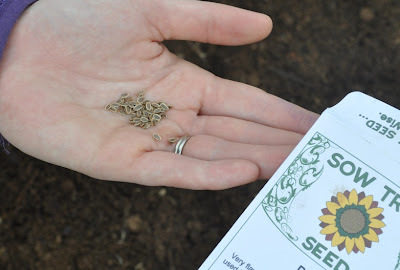 After you have selected your 2 varieties of vegetable or herb seed, put Asheville Fling Seeds in the subject line and email the variety names, along with your name, complete mailing address, and the name & URL of your blog, to: neeley@sowtrue.com. 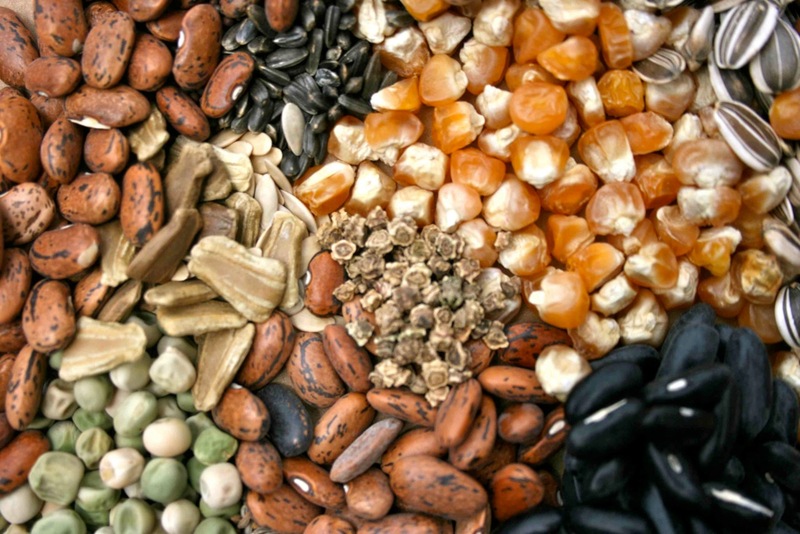 All seed requests will be compared to the paid attendees list on the Asheville Fling's blog. The deadline for this special offer is noon on Wednesday, March 14th. Then, get ready to receive your complimentary seed packets and a print catalog at no cost to you! During the Fling, Sow True Seed is excited to host an Open House on Thursday, May 17th from 1-5pm. Please make sure to swing by, take a short tour of our retail store and seed warehouse in downtown Asheville, and meet the Sow True Seed team. Light refreshments will be offered, including local beer from the Green Man Brewery, located just across the street from Sow True Seed. More details on this to come. The deadline for complimentary seed packets is by NOON on Wednesday, March 14th. Offer is limited to two (2) packets of vegetable or herb seed, and you must be registered and paid for the 2012 Garden Bloggers Asheville Fling to participate. Please note if the variety you request is out of stock, we will send you the most similar variety we have in stock, or feel free to add a third variety request as a back up (just in case).